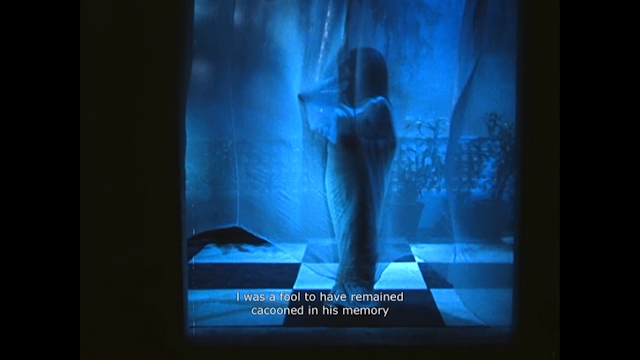 Filmi~Contrast: Filmi Women: Can suffering be liberating? 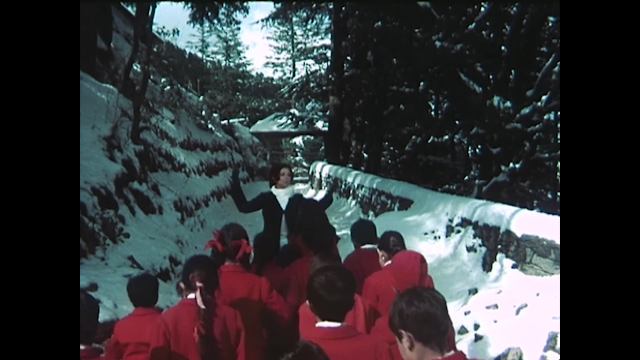 Filmi Women: Can suffering be liberating? 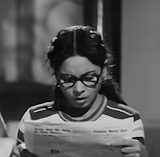 The more Indian films I watch, the more I am learning to weigh the female characters' actions and arcs by a different measure than I would in Western cinema. Time and again I see that the women in Indian films are more often the victims than the victimizers, more often the judged than the judge, more likely to sacrifice everything than be sacrificed for. This doesn't ruin the experience for me, but it does leave me with the feeling that I shouldn't have liked some films as much as I did, given their content. 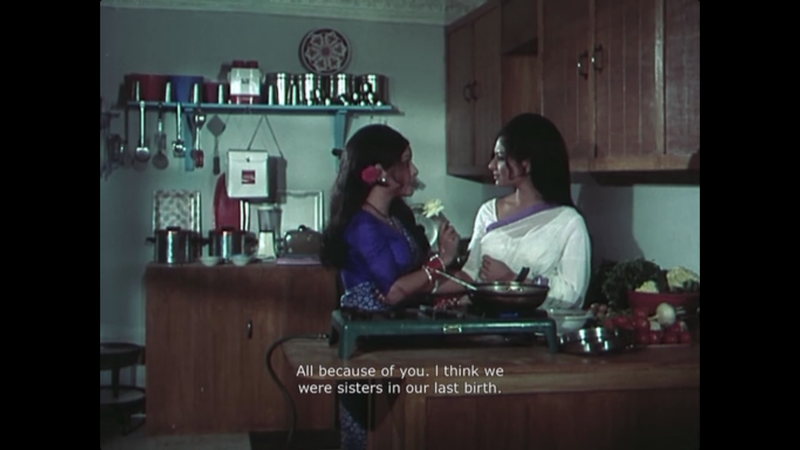 For example, I love 70's and 80's Masala films, and if I could live in any fictional universe it would be Planet Masala, but I am sometimes driven to distraction by the amount of cloyingly sacrificial mothers in these films. 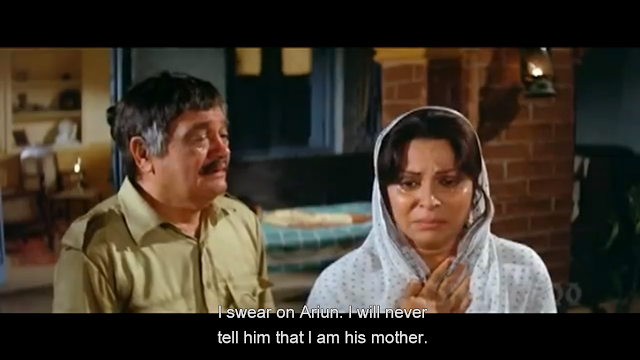 My least favorite Masala Mom to date: Waheeda Rehman in Namak Halaal agrees in like two seconds to give her son to his grandfather and go away forever because dear old Grandpa thinks Mama has done wrong (with no proof of course). 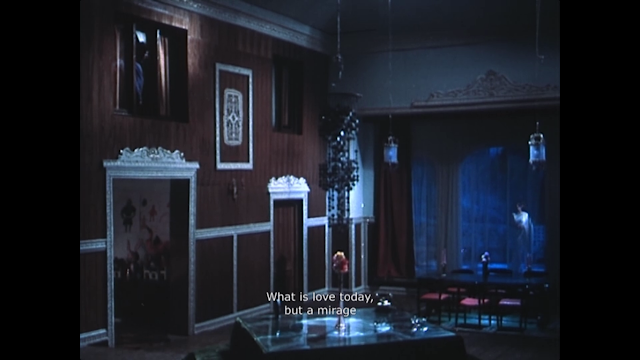 One of those instances when I really hope a scene makes more sense if you understand Hindi (but I doubt it). But these same fictional women shouldn't all be shelved into the "oppressive/regressive" category and forgotten. Not all suffering female characters are alike (thank the filmi gods). For me, a film's internal commentary about the female characters' sacrifices and hardships makes all the difference. I don't mind if a women is oppressed in a story--but what the film seems to say ABOUT that oppression can make or break a story for me. I can even like a character that doesn't stand up for herself if the film's narrative is strong enough to give her motivations that make sense and to show us that her lot is NOT her fault. After seeing the drop-dead amazing Kaala Patthar (1979) by Yash Chopra (a rare Indian movie in which female suffering hardly comes up), and finishing this even earlier Yash Chopra film, I wondered briefly what it would be like if Yash Chopra had quit making films while the women, ahem, were ahead. This film surprised me in several ways. 1. The suffering in this movie is unusually egalitarian. The injustice of the law and the acts of the villain (Prem Chopra) in this film affect all three of the leads equally and in turn. 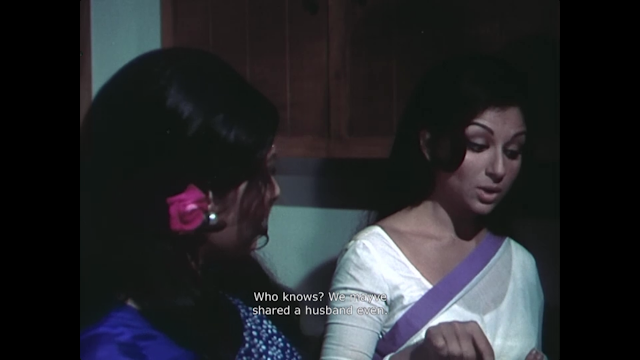 Sharmila Tagore suffers as a single mother/widow of a convict, Rajesh Khanna suffers as a man unjustly accused and hiding from the law, and Rakhee suffers as a passionate woman left with an illegitimate child living in a farcical marriage. 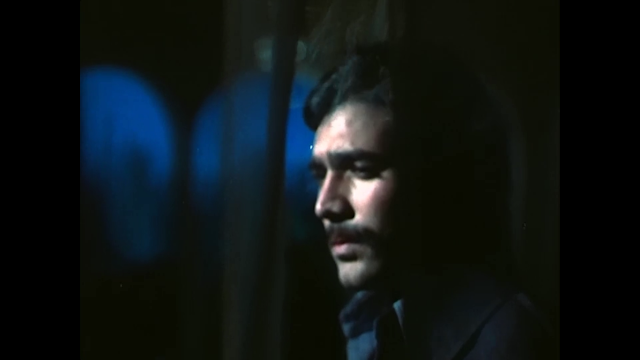 Each of the protagonists' motivations makes sense (especially for the early 70s) and the confusing triangle of relationships and lies and danger they find themselves by the middle of the film flow from believable reactions to difficult circumstances. These two have excellent friend chemistry. 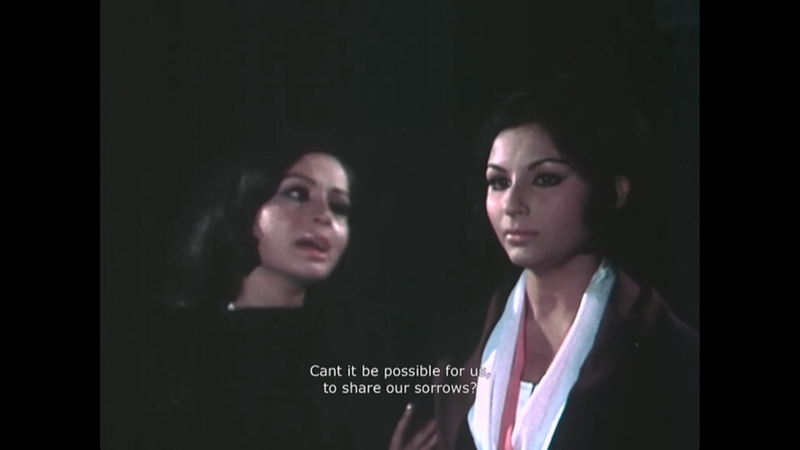 Though they are given every reason to dislike one another, Rakhee and Sharmila's characters nevertheless take care of one another selflessly out of loyalty and compassion. 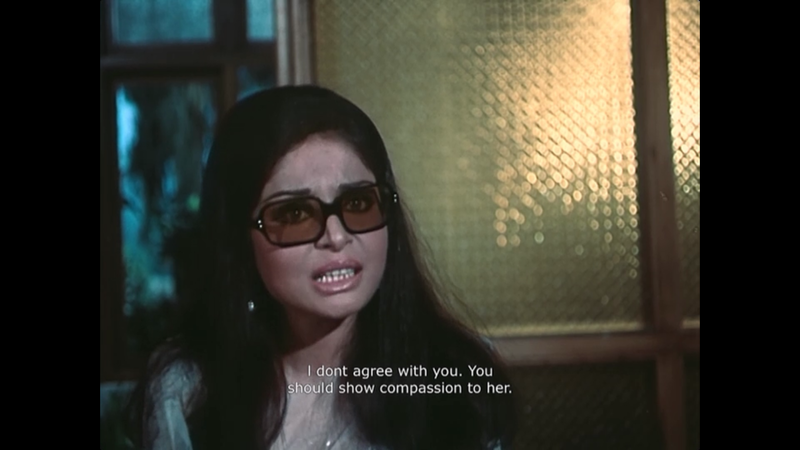 When Rakhee's character first appears, she is Sharmila's only advocate. In a nice filmi bookend, Sharmila's character is given the opportunity to return the favor much later. I like you best like this, Rakhee. Helping the helpless. Only in it's resolution does this film shows its bias: favor towards the married (read: innocent) characters (Sharmila Tagore and Rajesh Khanna) who have made the right moral decisions . . . and punishment for the loose woman (Rakhee). But of course, Rakhee's part of the family now, so she can't be punished too severely. 2. The woman's suffering is not silent. 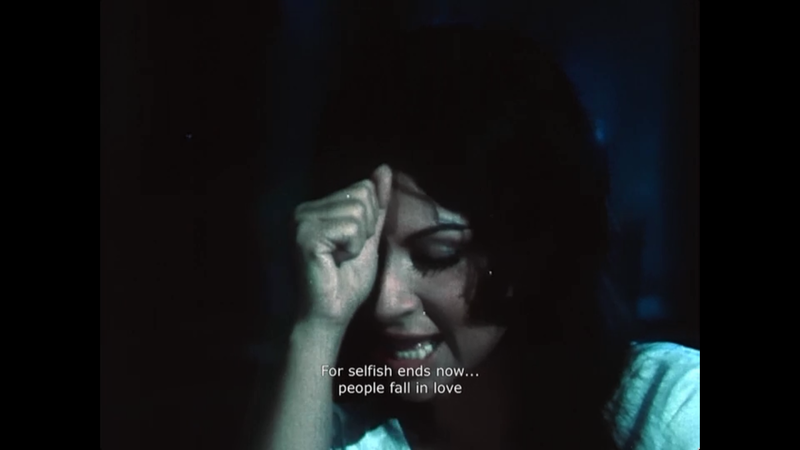 The best song and sequence of the film is given to Sharmila, in which she gets to say exactly what she thinks of people who betray those they love. What's almost more amazing than the song is to see her "betraying" husband's reaction to it . . . coupled with the fact that she does NOT choose to suffer all in silence, or to even sing her song in private, but to belt it out in a space where the "betrayer" is almost sure to hear it. And boy, does the usually "blameless" Rajesh look guilty. (His heroes are irritatingly beyond reproach in other films I've seen). Of course, it turns out that Rajesh's character didn't do much to deserve the reproach (although, he is annoyingly simplistic in his feelings for the family he has lived with for 5 years). But the important thing is that the movie gives the betrayed woman a voice, REGARDLESS of this reveal. She gets to FEEL what she FEELS, without having all the knowledge. Sure, her character ends up taking the high sacrificial road every time, but the film does NOT force her to like it. The women in this film haven't gotten what they wanted out of life. But they find unconventional ways of dealing with their problems, and support each other throughout. It's not exactly liberation or freedom, but women in this film exercise personal choice and actually recognize the legitimacy of their personal feelings. I'll take it.